Many of his tips were equally relevant to ID endeavors at home as well. Richard explained that you have to build from what you know, and he drew from his extensive photo library of plants to illustrate how he goes about the process of unraveling the mystery of a plant’s ID, whether here at home or further abroad. First, and perhaps foremost, on his list, is a small camera. This little tool enables you to record details safely, and then take them home where they can be used in conjunction with books or online information to reveal answers. Handy as the camera is, he did admit that using it has, on more than one occasion, led to his not only being left behind on a hike, but becoming lost as a consequence! Recommended Field Guides were: the National Audubon Wildflower Society Wildflower Field Guides, the Peterson Wildflower Field Guides – these two publish books that cover a variety of geographic areas – and Newcomb’s Wildflower Guide, which covers only Virginia and includes a key. Next in the lineup of books are the many hardback Floras. The audience enjoyed a story of friends who were so dedicated in their ID study that they actually carried an ice chest packed with Floras wherever their journeys took them. At the end of a day’s hike, the ice chest was converted to beer duty. Excellent recycling! Richard showed the audience some of his favorite online databases, and used the USDA Plants Database to show how it is possible to search by many different criteria to find a particular plant. Online Floras are available in many countries, he said, and for those that aren’t in English, you can always use Google Translate. Making the effort to get to know a bit about the plant families is worth the time. Using the Fabaceae family as an example, Richard illustrated how knowing a few basic family characteristics, in this case, pinnately compound leaves, presence of banner and keel formation, and pea-like pods gives a pathway for searching. 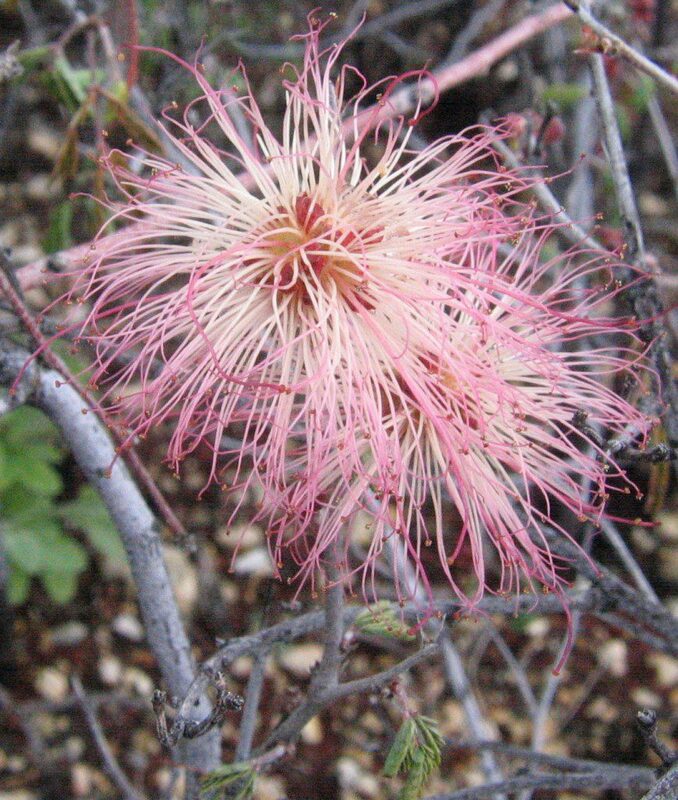 A member of the Fabaceae family, Calliandra eriophylla, or fairy duster. This Arizona native was identified through the presence of the recognizable family characteristics. He also mentioned a Tip In The Making, which is the The Flora of Virginia App. Several VNPS members are working on this project, including the Piedmont Chapter’ s president, Sally Anderson. Sally explained that they are testing a model from High Country Apps, one that both Oregon and Yellowstone have had good success with. Refreshments and discussion followed the informative talk Don’t miss the second in the Series, Familiar Flora Amid Siberian Splendor, by Dr. Emily Southgate. Virginia Working Landscapes, among other things! If I wanted to identify a native vine, where could I send a photo and description? Would there be fee? Thanks for your time and kind attention.